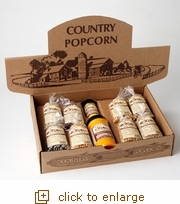 Give the gift of surprise popcorn with this Amish Country popcorn gift set. Packed with 8 different 4 ounce bags of popcorn, this gift set makes a perfect present for the popcorn enthusiast who has everything. Along with the 8 flavors of popcorn, the gift set also includes Tender Pop Coconut Oil and Movie Theater Style Seasoning, so your favorite popcorn tastes are all here. This popcorn is fresh from the farm and every flavor is delicious. These sets make excellent popcorn gifts for friends, family, or yourself! Try our Amish Country popcorn gift set today.